When parsing the releases of 2013 for the film that best captured the national mood, there is no shortage of contenders. Wolf of Wall Street and its magnetic lunacy captured our complicated relationship with wealth in America. 12 Years a Slave brought us closer to revealing the raw, tender heart of our racial issues than any film in recent memory (and Fruitvale Station and The Butler weren’t far off, either). Spike Jonze’s magnificent Her presented a new vision of our rapidly-evolving relationship with technology. But there is another film, one that few critics are counting among the year’s best, that perfectly captures the hypocrisies of our time and even reveals some deeper, eternal truths. It is a film that bombed at the box office but will surely be due for a critical reevaluation at some future point, when it will finally be recognized as the classic that it is. It is a film called White House Down. How to describe such a complex and though-provoking film? A lot of critics called it “Die Hard in the White House,” and it’s easy to see the similarities: instead of John McClane and the Nakatomi building, we get John Cale (Channing Tatum) and 1600 Pennsylvania Avenue. Cale is a veteran of the Afghanistan war, single father, and Capitol policeman who has just been turned down for a job in the Secret Service when a ragtag cadre of domestic terrorists invade the White House and take the president (Jamie Foxx) hostage. In the ultimate job interview, Cale gets separated from his daughter and, after teaming up with the president, fights to save both his little girl and the country. Is it as ridiculous as it sounds? Yes, sir. But so is our political culture that it reflects. In 2013, we remained caught in a dysfunctional cycle of lifting up and tearing down our democratically-elected leaders. Look at the evidence. On the one hand, everyone seems to agree that our government has reached new depths of dysfunction. A new CNN/ORC poll shows 67%, two-thirds of the country, call this the worst Congress of their lifetime. 73% say Congress has done nothing to address the country’s problems. This part probably goes without saying: Congress’s approval rating is at a record low, with only 9 percent of Americans supportive of the job its federal representatives are doing. Meanwhile, Congressional districts have become so polarized that most federal representatives can run on an anti-Washington platform and their constituents will vote for them, happy that they at least have someone in Congress representing their values. And still our interest in politics is hovering near all-time highs. 130 million Americans voted in the 2008 presidential election, shattering all previous records. Although 13 million people fewer voted in 2012, it still out-paced most previous years, beaten only by 2008 and 2004. But the voter rolls only tells part of the story. Look at our pop culture. Politics have invaded our television sets with shows such as Scandal, Veep, House of Cards, Alpha House, Political Animals, and The Newsroom. Meanwhile, movie stars are more involved than even before. Obama counted a record number of celebrity endorsements in 2008, and he has continued to use them while in office: this year, he enlisted the help of actors such as Olivia Wilde, Taye Diggs, and Scarlett Johansson to help convince young American to sign up for health care coverage. White House Down effortlessly weaves this complex, almost dichotomous relationship between America’s citizens and its government into a thoroughly entertaining, shoot-‘em-up action flick. In between flying bullets and splattering blood, the characters display a great reverence for federal government, like the Secret Service agent who tells a colleague that theirs is “the best job in the world” or Cale’s daughter, a self-described “political junkie” who holds an adoration for the president that most normal 11-year-olds reserve for Justin Bieber. The opening sequence, in which the president requests that his helicopter fly low over the National Mall so he can appreciate the grandeur of Washington, is thick with reverence and plays like a bad, late-run episode of The West Wing. Further, President Sawyer (Jamie Foxx), one of the film’s heroes, is an undeniable stand-in for Obama: a former academic who loves basketball and is trying to quit smoking. But Emmerich makes him more of a liberal fantasy than a realistic depiction of Obama. As the film begins, he is working to create peace in the Middle East by passing the biggest aid package in history. Unlike our current leaders, he believes that the best way to prevent crime – even on a global scale – is to feed the hungry. This is a vision of government at its very best: noble, earnest, and able to do good. The film’s purported commitment to promoting peaceful solutions, however, is thoroughly undercut by its violence. It is packed with wall-to-wall violence, but no blood – a trick that makes the mayhem seem consequence-free and allows the viewer to ignore its moral implications. Even worse, inherent in the plot is a gleeful anti-government message that caters to the worst impulses of the American electorate – a desire to put the hurt on the bureaucrats in charge. Here’s just one example: two terrorists enter a room where several cabinet officials are hiding. Bad Guy #1 pulls his weapon and shoots one official in the head. “You just killed the Secretary of Defense,” says Bad Guy #2. “He wasn’t doing a very good job,” says the first one. The line is played for laughs, but there’s catharsis in it, too. Underneath the quip beats the heart of an angry, disenfranchised American who wouldn’t mind a little violent revenge on the government – and there are certainly many of them out there. We can only hope that this film offers them an emotional release for their violent tendencies, instead of stoking the fire of our collective anger and resentment. The partisan lines are being redrawn, and both civil libertarians and progressive Democrats have objected to these abuses of power. But despite our collective frustration with dysfunction in Washington, we keep watching. We watch the 24-hour news channels and read political blogs, and we remain torn between hope and resentment. White House Down reflects this conflicted state. Do we want to encourage our political leaders to do better, or would we rather just blow it all up and start over? 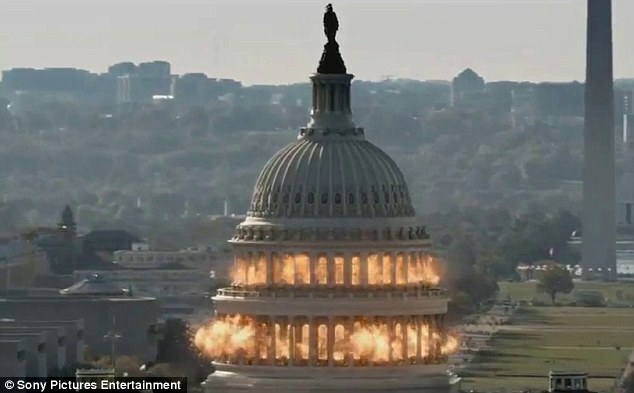 In asking us to simultaneously worship the president’s commitment to world peace and then gleefully watch as Washington literally burns, White House Down suggests – correctly, I might add – that we don’t quite know. The film holds a fun-house mirror up to our perplexing political discourse but also hints at a deeper truth: reverence is a form of destruction, or at least a gateway to it, and that a nation founded on ideals will never live up to them. Read about 2012’s movies of the year here. To a large extent so did ‘Independence Day’ when the Capital building was blown up. Almost everyone was happy and cheering. I do agree with the part about feeding everyone. However savages do what they do best, break things and kill people. They target innocent people as a group and unlike our wayward soldiers who act out, there is not this mad unreality that permeates our world.